There were two places in Texas named Crush. This is the brick plant town --- THERMO, TEXAS. Thermo, on Farm Road 1870 and the Louisiana and Arkansas Railway, five miles east of Sulphur Springs in eastern Hopkins County, was founded around 1900. A brick manufacturing plant was established in 1910. 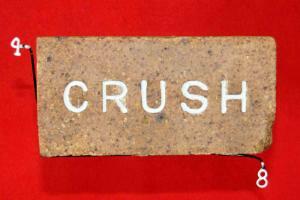 The community was originally known as Crush, after a large rock crusher near the townsite. The rock was used for construction of railroad lines. The town's name was later changed to Thermo, for the Thermo Fire Brick Company, which produced fire-resistant brick. In the mid-1930s the community had the factory and a number of houses. In the late 1980s the factory was still in operation. The community was still listed in 1990. Christopher Long, "THERMO, TX," Handbook of Texas Online (http://www.tshaonline.org/handbook/online/articles/hrt16), accessed August 23, 2012. Published by the Texas State Historical Association. One hunded and twelve years ago this month, 40,000 people paid good money to be frightened within an inch of their lives. Gathered on hillsides overlooking a railroad track between Waco and Hillsboro, the crowds came to watch a planned head-on crash between two locomotives owned by the Missouri, Kansas and Texas Railroad. (usually called the Katy). The stunt was planned by William G. Crush, a passenger agent for the Katy as the means to generate attention for the railroad and sell a lot of passenger tickets. Recalling the old gladiatorial days of Rome, Crush wanted something spectacular. The crash site, dubbed Crush for the promoter, was a natural amphitheater between three hills, giving the crowd a good view of the event, which was publicized all over the country. The year 1896 was also a big political year with William Jennings Bryan’s first campaign for president. Crush invited all political candidates to address the crowd of thousands. Several did--all day long. Motion pictures were also in their infancy and Thomas Edison sent one of his cameramen from New York to capture the crash on film. The two Baldwin locomotives, Engines 999 and 1001, were somewhat outmoded, but were in good working condition. Before 5 p.m. on September 15, the two locomotives rolled up to the crash site within a few feet of each other, as if bowing in respect, and then backed off to a point within a mile of the crash scene. At 5:10 p.m., the engines started down the track at speeds of forty-five miles an hour. The engineers jumped from each train, their throttles locked down, and the locomotives struck head-on with such force that both were telescoped into junk. Both boilers exploded at the same time and the air was filled with pieces of metal and steel from the size of a postage stamp to half of a driving wheel. Dozens of people were injured and one of those hurt later died from a head injury caused by a flying fragment of chain. A photographer who recorded the event was hit in the eye by a fragment, but recovered. Even as the dust was settling from the crash, people rushed from the hills to collect souvenirs. Everything that could be lifted from the ground was gobbled up by the crowds. When railroad officials started cleaning up the wreckage, they found a railroad watch inside one of the engines. It was still running. In the months following the crash, lawsuits filled the courthouse and the Texas Legislature banned intentional train crashes. William Crush, the promoter, ironically did not see the crash and only reached the scene several minutes after it occurred. He later apologized for the injuries and the fatality and was fired by the railroad. But he was rehired after the company’s president decided that the crash had, indeed, brought a lot of publicity to the Katy.